The vast majority Muslim scholarship are of understanding that Shaykh Muhammad Bin Abdul Wahhab, the founder of Wahhabi sect, and all adherents of this sect in any form or label are an off-shoot of Khariji apostasy. And this understanding is fully in accordance with teaching of Prophet (sallallahu alayhi wa aalihi was’sallam). Number of articles were written in which Islamic position was established with backing of Ahadith. But a Salafi/Wahhabi brother wrote an angry email in which he protested the innocence of Shaykh Muhammad Bin Abdul Wahhab and argued that Ahadith of Khawarij were wrongfully applied to him. I) The Ahadith which predict emergence of horn (or group) of Satan from Najd are regarding Iraq and Khawarij which emerged from Iraq. II) Even if these Ahadith are imposed on central Arabia, or Saudi province of Najd, area surrounding Saudi capital Riyadh, even then these Ahadith are to be applied upon Khawarij of Iraq who were supported by members of Banu Tamim. And this establishes that Shaykh Muhammad Bin Abdul Wahhab is free of blame of being Khariji. 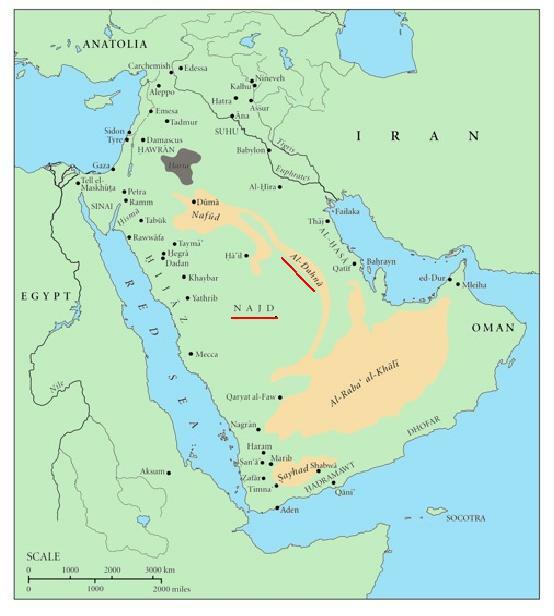 Muslim scholars are of the opinion that Khawarij from Banu Tamim marched from Saudi Arabian region of Najd [area surrounding Riyadh] to Syria and after falling out with Hadhrat Ali (radiallah ta’ala anhu) returned with his army to Iraq but camped at Harura and later Nahrawan.Where they fought against rightly guided Khalifah Hadhrat Ali (radiallah ta’ala anhu). Amongst these Kharijis of Banu Tamim was Dhil Khuwaisirah at-Tamimi, the Najdi. Keeping this Islamic position in mind the Salafi brother stated: “Even if these Ahadith are imposed on central Arabia, on Saudi province of Najd, area surrounding Saudi capital Riyadh, even then these Ahadith are to be applied upon Khawarij of Iraq who were supported by members of Banu Tamim.” Indicating he is assuming this position for sake of argument but does not actually believe this. And for his benefit and others like him, if Allah permits, the Islamic position will be established with sound reasoning and evidence in the following sections but as a starter refer to, here. 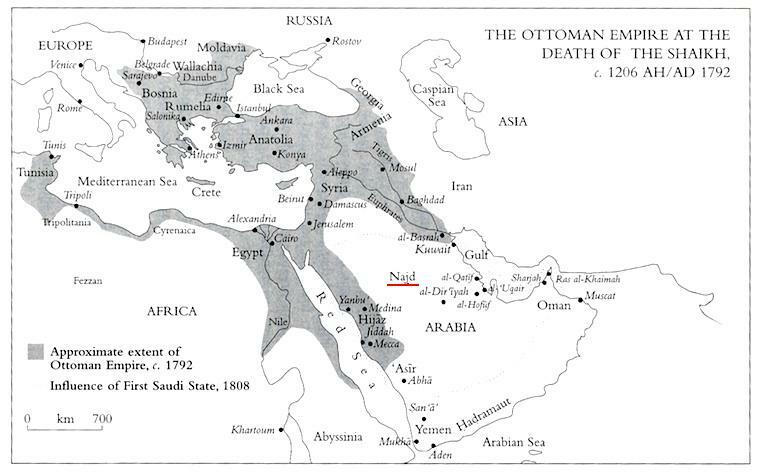 Brother connected tribe of Banu Tamim to Riyadh, and Tamimi’s to Khawarij of Iraq, because this would establish, Khawarij emerged from Najd, and marched to Syria and than to Iraq from Najd, long before Shaykh Muhammad bin Abdul Wahhab. And due to this; the condition of Ahadith were fulfilled before birth of Shaykh Muhammad Bin Abdul Wahhab and to be specific in life time of Hadhrat Ali (radiallah ta’ala anhu). And therefore by default Shaykh of Najd is innocent of being part of Khariji sect. And to be honest this argument (II) is a very potent argument. It demonstrates brother had evaluated arguments presented against his belife and argued his case with sound deductive tools. This is by far the most academic argument presented in defence of Shaykh of Najd. But it is in vain and does nothing to vindicate the Shaykh nor those who follow his footsteps. In order to successfully and comprehensively refute second argument. And to establish Islamic position that Shaykh Muhammad Bin Abdul Wahhab was indeed from group of Satan aka Khawarij: Firstly - It needs to be established that Dhil Khuwaisirah at-Tamimi and his companions existed in Arabian province of Najd in during the life time of Prophet (sallallahu alayhi wa aalihi was’sallam). And Prophet (sallallahu alayhi wa alahi was’sallam) referred to them as group of Satan, aka Khawarij. Secondly - They went to Syria with army of Hadhrat Ali (radiallah ta’ala anhu) to fight against Amir ul-Momineen Muawiyah (radiallah ta’ala anhu). And they disagreed with Hadhrat Ali’s (radiallah ta’ala anhu) decision of arbitration and were disenchanted with him. Thirdly - They returned to Iraq and camped at Harura then Nahrawan and fought against Hadhrat Ali (radiallah ta’ala anhu) and the Iraqi’s killed the Khawarij. Fourthly - Dhil Khuwaisirah at-Tamimi and his companions were killed in Iraq [and not Khawarij to emerge from his progeny]. Fifthly - Prophet (sallallahu alayhi wa aalihi was’sallam) foretold of two groups of Satan would emerge from land of Banu Rabia and Banu Mudhar [situated in East of Madinah, in region of Najd]. Sixthly - Prophet (sallallahu alayhi wa aalihi was’sallam) told from posterity/descendents of Dhil Khuwaisirah at-Tamimi a group will arise [again]. Seventhly - Shaykh Muhammad Bin Abdul Wahhab is considered Khawarij to emerge from progeny/posterity of Dhil Khuwaisirah at-Tamimi and not from his companions. Eightly – If Hadith of group of Satan emerging for Najd means man power of Najd would appear from Najd or a sect would appear from Najd. Finally – How these steps establish charge levelled against Shaykh Muhammad Bin Abdul Wahhab will be concluded in accordance established facts. Prophet (sallahu alayhi wa aalihi was’sallam) was by the side of pulpitof Masjid Nabvi and pointed out direction from which the group of Satan will emerge: “The Prophet stood up beside the pulpit and said, "Afflictions are there! Afflictions are there, from the side where ‘group of Satan will come out’, or said, ‘the side of the sun’." [Ref: Bukhari, B88, H212] "Verily, afflictions (will start) from here" pointing towards the east; "whence the side of the group of Satan comes out." [Ref: Bukhari, B56, H714] Another Hadith establishes Prophet (sallallahu alayhi wa aalihi was’sallam) was pointing toward the house of Hadhrat Aysha (radiallah ta’ala anha) to indicate the precise direction of East: “Narrated 'Abdullah: The Prophet stood up and delivered a sermon, and pointing to 'Aisha's house, he said thrice, "Affliction (will appear from) here," and, "from the side, where Satan's group will come out." [Ref: Bukhari, B53, H336] Alhasil from pulpit to East and East in direction of Hadhrat Aysha’s (radiallah anha) house is precisely toward Saudi capital Riyadh and toward the birth town Shaykh Muhammad Bin Abdul Wahhab [Uyaynah], and toward missionary centre activity centre [Dir’riyyah]. This fact has been depicted on the maps in following article, here. And this area is precisely the Najd regarding which Prophet (sallallahu alayhi wa aalihi was’sallam) foretold group of Satan will emerge from it: “Narrated Ibn 'Umar: (The Prophet) said, "O Allah! Bless our Sham and our Yemen." People said, "Our Najd as well." The Prophet again said, "O Allah! Bless our Sham and Yemen." They said again, "Our Najd as well." On that the Prophet said, "There will appear earthquakes and afflictions, and from there will come out the side of the group of Satan." 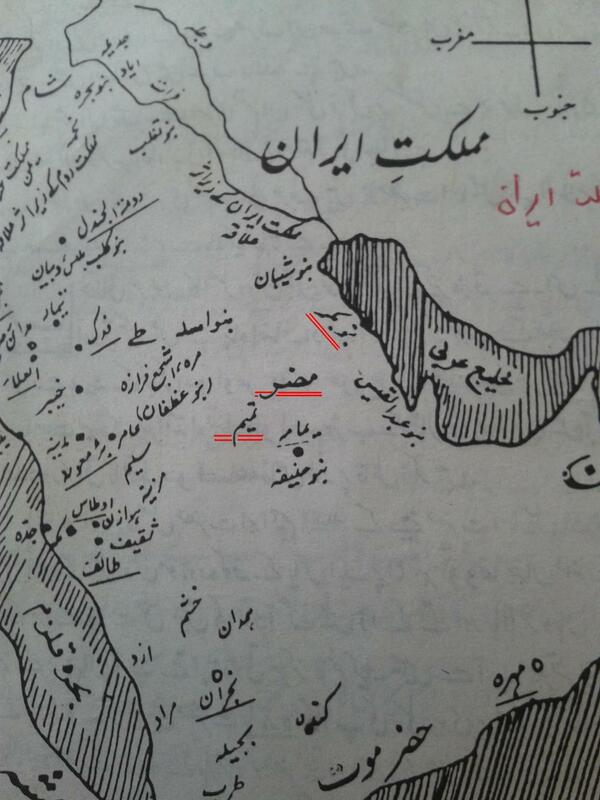 [Ref: Bukhari, B17, H147] Following two articles depict where Najd is; here and here. In an attempt to point the region from which group of Satan was to emerge Prophet (sallallahu alayhi wa aalihi was’sallam) had pointed toward house of Hadhrat Aysha (radiallah ta’ala anha). That is to say, he pointed toward East, and pointed toward the region of Najd. Hence Shaykh Muhammad Bin Abdul Wahhab cannot excluded from being leader of group of Satan on grounds; intended Najd is Iraq and therefore Ahadith of Najd apply upon Khawarij of Iraq. Because Ahadith have indicated a precise direction and a region. And both, the name of Najd and direction of East cannot be applied to Iraq.Therefore the argument by Najd Prophet (sallallahu alayhi wa aalihi was’sallam) intended Iraq is invalid. And nautrally Ahadith of Najd can be applied to the group of Khawarij which were to appear from Iraq. This leaves me with argument number two and to refute this argument evidence on which it is based needs to be explained properly. Evidence establishes Dhil Khuwaisirah and his companions even existed during the life time of Prophet (sallallahu alayhi wa aalihi was’salam) because when permission was sought to kill Dhil Khuwaisirah at-Tamimi Prophet (sallallahu alayhi wa aalihi was’sallam) had stated he has companions: “… While the Prophet was distributing (war booty – raw gold) one day, Dhul Khawaisira, a man from the tribe of Bani Tamim, said, "O Allah's Apostle! Act justly." The Prophets said, "Woe to you! Who else would act justly if I did not act justly?" 'Umar said (to the Prophet ), "Allow me to chop his neck off." The Prophet said, "No, for he has companions (who are apparently so pious that) if anyone of (you compares his prayer with) their prayer, he will consider his prayer inferior to theirs, and similarly his fasting inferior to theirs, ... Abu Sa`id added, "I testify that I heard that from the Prophet, and also testify that I was with Ali when Ali fought against those people.” [Ref: Bukhari, B73, H184] And in another Hadith following is narrated: “Leave him, for he has companions, and if you compare your prayers with their prayers and your fasting with theirs, you will look down upon your prayers and fasting, in comparison to theirs. Yet they will go out of the religion as an arrow darts through the game's body in which case, …” [Ref: Bukhari, B84, H67] So the Khawarij already existed in Arabia. Where were the companions of Dhil Khuwaisrah at-Tamimi? They were in province of Najd during the life of Prophet (sallallahu alayhi wa aalihi was’sallam). Prophet (sallallahu alayhi wa aalihi was’sallam) said: “The Prophet stood up beside the pulpit and said, "Afflictions are there! Afflictions are there, from the side where ‘group of Satan will come out’, or said, ‘the side of the sun’." [Ref: Bukhari, B88, H212] "Verily, afflictions (will start) from here" pointing towards the east; "whence the side of the group of Satan comes out." [Ref: Bukhari, B56, H714] In another Hadith Prophet (sallallahu alayhi wa aalihi was’sallam) refused to supplicate for people of Najd and he explains why: “Narrated Ibn 'Umar: (The Prophet) said, "O Allah! Bless our Sham and our Yemen." People said, "Our Najd as well." The Prophet again said, "O Allah! Bless our Sham and Yemen." They said again, "Our Najd as well." On that the Prophet said, "There will appear earthquakes and afflictions, and from there will come out the side of the group of Satan." [Ref: Bukhari, B17, H147] “The people said, "O Allah's Apostle! And also on our Najd." I think the third time the Prophet said, "There (in East) is the place of earthquakes and afflictions and from there comes out the group of Satan." [Ref: Bukhari, B88, H214] Important note, during the life time of Prophet (sallallahu alayhi wa aalihi was’sallam) Islam did not reach Iraq nor Iraq was conquered: “Iraq will be conquered and some people will migrate (from Medina) and will urge their families and those who will obey them to migrate although Medina will be better for them; if they but knew." [Ref: Bukhari, B30, H99] Therefore the people who requested Prophet (sallallahu alayhi wa aalihi was’sallam) to supplicate for Najd could not have been residents of Iraq. But Najd was conquered by Islamic armies and its inhabitants had accepted Islam. The Najd of Hadith in dicussion is in the direction of East from Madinah, here. Detailed information with numerous old and new maps in connection to Najd can be accessed in the following articles, here. The native lands of Banu Tamim to which Dhil Khuwaisirah at-Tamim belonged to is said to be on otherside of ad-Dahna: “Apostle of Allah, he did not ask you for a true border when he asked you. This land of Dahna is a place where the camels have their home, and it is a pasture for the sheep. The women of Banu Tamim and their children are beyond it.” [Ref: Abu Dawood, B19, H3064] Ad-Dahna is name of dessert in Najd to certify please see the following map, here. 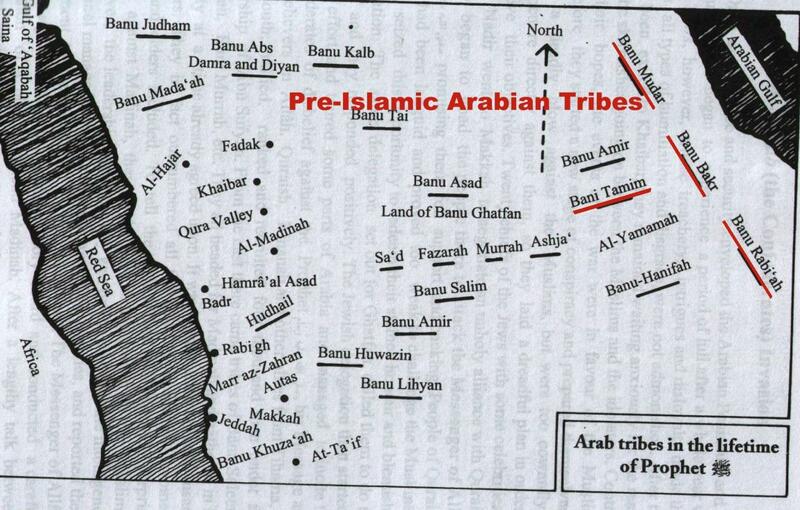 And following map depicts Banu Tamim with other tribes, here, here. Based on the bare facts: Dhil Khuwaisirah at-Tamim belonged to tribe of Banu Tamim. Najd is East of Madinah and, native land of Bani Tamim is Najd, Dhil Khuwaisirah and his companions existed during the life time of Prophet (sallallahu alayhi wa aalihi was’sallam) -: It can be concluded Prophet (sallallahu alayhi wa aalihi was’sallam) pointed toward East, in direction of Najd, and told of group of Satan, meaning Dhil Khuwaisirah at-Tamim and his followers/companions. In the conclusion of section 2.2 evidence of what preceded it established Dhil Khuwaisirah at-Tamimi and his companions were referred by Prophet (sallallahu alayhi wa aalihi was’sallam) as the group of Satan. In section 3.0 it was established that Prophet (sallallahu alayhi wa aalihi was’sallam) foretold; Dhil Khuwaisirah and his companions would appear when there will be difference between Muslims. And it was established the difference was between Ali (radiallah ta’ala anhu) and Muawiyah (radiallah ta’ala anhu). In section 3.1 it was established that a faction – composing of Dhil Khuwaisirahs companions, or group of Satan - from Ali’s (radiallah ta’ala anhu) army deserted him and headed for Iraq and camped at Harura [a village near Kufah]. And due to their raids which resulted in deaths of Muslims Ali (radiallah ta’ala anhu) decided to confront Dhil Khuwaisirah’s group of Satan and both armies camped at Nahrawan. Continuing and building upon earlier established position and conclusions – in section 2.2, and 3.2 .It was established in section 4.0 that Dhil Khuwaisirah at-Tamimi was the man who is said to have said to Prophet (sallallahu alayhi wa aalihi was’sallam) to fear Allah (subhanahu wa ta’ala). And Prophet (sallallahu alayhi wa aalihi wa’ssallam) intended to indicate emergence of Dhil Khuwaisirah and his companions as a sect. And referred to them as group of Satan. This sect appeared during the battle of Siffin. And abandoned the side of Ali (radiallah ta’ala anhu) and returned to Iraq. At Nahrawan this group of Satan met the army of Ali (radiallah ta’ala anhu) and were completely anahilated. Amongst the dead of Khawarij – aka group of Satan – body of Dhil Khuwaisirah was found. And it was his hand which resembelled a woman’s breast. He was part of army of Khawarij and he his companions were killed by the hands of Iraqi army – group near to truth - lead by Ali (radiallah ta’ala anhu). Prophet (sallalahu alayhi wa aalihi was’sallam) stated: “And harshness and callousness of the hearts is found amongst the rude owners of the camels, who drive them behind their tails (to the direction), where emerge the two horns of Satan, they are the tribes of Rabi'a and Mudar.” [Ref: Muslim, B1, H83] In context of following Ahadith: “The sun rises between the two horns of Satan.” [Ref: Ibn Majah, B5, H1253] “… and it rises between the two horns of Satan.” [Ref: Ibn Majah, B5, H1251] “… then do not pray until the sun has risen, for it rises between the two horns of Satan.” [Ref: Ibn Majah, B5, H1252] The words of - H83 – can mean Banu Rabia and Mudhar are the two horns of Satan and the sun rises between their territorial boundaries. Or it could mean the rude owners of camels/horses are tribes of Rabia and Mudhar and two groups of Satan will emerge from their lands [but not necesserily from them] and sun rises between northern and sourthern boundaries of these two tribes. It should be explained why Prophet (sallallahu alayhi wa aalihi was’sallam) pointed to emergence of two groups of Satan aka Khawarij when in reality there are more then fifteen which originated from Khawarij of Iraq. The reason is simple, the first sect of Khawarij spawned many variations in their teachings but all had central core uniting them. And the second group of Khawarij would also spawn many variations but like the first one these mutations will share a central core. The only difference would be that second major resurgance of Kharijism will have a core connection which would link them with the first sect of Khawarij. For a detailed study please also refer to article related to the Hadith of two groups of Satan, here. But do note it is not important, skipping it will not impede your understanding of this article. It is fundamentally important you refer to following map which depicts where various tribes were situated during the life time of Prophet (sallallahu alayhi wa aalihi was’sallam), here. Take note how the two tribes of apart from each other and then compare their location with regards to northern and southern sunrise boundaries, here. If you have paid attention you will realize siutation of these two tribes roughly correlates to northern and southern sunrise boundaries. And this establishes Prophet (sallallahu alayhi wa aalihi was’sallam) intended to indicate boundary of sunrise by using the location of these two tribes. Alhasil the two groups of Satan to emerge would emerge from the Northern and Southern boundaries of sunrise of Banu Rabia and Banu Mudhar: “And harshness and callousness of the hearts is found amongst the rude owners of the camels, who drive them behind their tails (to the direction), where emerge the two horns of Satan, they are the tribes of Rabi'a and Mudar.” [Ref: Muslim, B1, H83] And Prophet (sallallahu alayhi wa aalihi was’sallam) used the location of these two tribes to give general direction from where the two groups of Satan would emerge – between the Northern and Southern boundaries of Banu Rabia and Banu Mudhar – but in another Hadith Prophet (sallallahu alayhi wa aalihi was’sallam) precisely pointed the direction from which the group of Satan would emerge: “Narrated 'Abdullah: The Prophet stood up and delivered a sermon, and pointing to 'Aisha's house, he said thrice, "Affliction (will appear from) here," and, "from the side, where Satan's head will come out." [Ref: Bukhari, B53, H336] And the direction he pointed toward is pretty precisely of al-Uyayna and al-Dirriyyah, here. One is birth place of Shaykh Muhammad Bin Abdul Wahhab and other later became his missionary activity centre. It has been established, Banu -: Rabia and Mudhar are situated in East of Madinah, in the direction of sunrise, and in region of Najd. And Prophet (sallallahu alayhi wa aalihi was’sallam) foretold two groups of Satan would emerge from the lands of these two tribes. And in light of findings presented in conclusion of section, 2.2, 3.2, and 4.2, Rabia and Mudhar were situated in Najd. And the first group which originated from Najd [and from tribe of Banu Tamim] was of Abdullah, also known as, Dhil Khuwaisirah, the Tamimi. Who along with his seemingly pious/righteous companions was killed by Iraqi’s at Nahrwan. Mawlana Ismail Shaf’ee Malibari (hafidullah) investigated the geneology of Shaykh Muhammad Bin Abdul Wahhab in his, Aqeedat us-Sunnah, pages 15/16, presented following brief geneology of Shaykh of Najd: “Muhammad, bin Abd al-Wahhab, bin Sulayman, bin Ali [bin Muhammad, bin Ahmad, bin Raashid, bin Burayd, bin Muhammad, bin Mashraf, bin Umar, bin Mi'daad], bin Ra’ees, bin Zakhir, bin Muhammad, bin Ali, bin Wuhayb, bin Dhil Khuwaisirah, bin Zuhayr, [bin Shihaab, bin Rabee'ah, bin Abee Saud] …” Note additions in brackets is my own to expand the geneology to its full length. Currently I am working on article which will be titled: Kharijism And Wahhabism -: Shaykh Muhammad Ibn Abdul Wahhab Descendant Of Dhil Khuwaisirah - The Infamous Hurqus - Ibn Zuhayr. If Allah (subhanahu wa ta’ala) permits me to complete this article than in due time research with supporting evidence will be published. Long before Shaykh Ismail Shafa’ee (hadfidullah), and myself contempories of Shaykh Muhammad Bin Abdul Wahhab such as Shaykh Syed Alvi Haddad Shafa’ee (rahimullah), and Shaykh Syed Ahmad Dahlan Shafa’ee had charged him of being group of Satan to emerge from posterity of Dhil Khuwaisirat at-Tamim and this is nothing new. Prophet (sallallahu alayhi wa aalihi was’sallam) foretold near the end of times from the progeny of Dhil Khuwaisirah at-Tamimi a group of Khawarij would [re-appear]. Geneological research of Shaykh Muhammad Bin Abdul Wahhab’s reveals he indeed is from the progeny of Dhil Khuwaisirah, also mentioned as, Abdullah in Ahadith of Sahih Bukhari, Hurqus Ibn Zuhayr, in Hadith of Sunan Abu Dawood. If there is no justifiable and evidenced basis to apply the - progeny - prophecy of Prophet (sallallahu alayhi wa aalihi was’sallam) upon Shaykh Muhammad Bin Abdul Wahhab than by Allah (subhanahu wa ta’ala) it will not be attempted. Nor a Muslim should apply the prophecy upon Shaykh of Najd if he/she knows Shaykh is not a descendent of Dhil Khuwaisirah at-Tamimi. It would be unacademic and it would prevent the true culprit of the prophecy to escape recognition. This does not mean Shaykh of Najd would not and is not Khariji, Shaykh surely is Khariji. Prophet (sallallahu alayhi wa aalihi was’sallam) has stated: “The Prophet said, "There will emerge from the East some people who will recite the Qur'an but it will not exceed their throats and who will go out of the religion as an arrow passes through the game, and they will never come back to it unless the arrow, comes back to the middle of the bow.” [Ref: Bukhari, B93, H651] "Did you hear the Messenger of Allah making a mention of the Khawarij? He said: I heard him say and he pointed with his hand towards the east that there would be a people who would recite the Qur'an with their tongues and it would not go beyond their collar bones. They would pass clean through their religion just as the arrow passes through the prey." [Ref: Muslim, B5, H2336] In Ahadith Prophet (sallallahu alayhi wa aalihi was’sallam) has stated: From East [of Madinah] a people would appear who would recite the Quran with their tongues but Quran would not exceed their throats/collar-bone and they will cleanly go out of religion of Islam like an arrow passes through the prey and they will not revert back to true Islamic teachings until it becomes possible for the arrow to return to the bow – or impossible becomes possibe. And about these same people Prophet (sallallahu alayhi wa aalihi was’sallam) stated in the following Hadith: “It was narrated from Ibn Umar that: The Messenger of Allah said: "There will emerge people who will recite the Qur'an but it will not go any deeper than their collar bones. Whenever a group of them appears, they should be killed/eliminated." Ibn Umar said: "I heard the Messenger of Allah say: 'Whenever a group of them appears, they should be killed/eliminated.' [He said they will appear] more than twenty times - until Dajjal emerges among them.'" [Ref: Ibn Majah, B1, H174] In light of this Hadith, if impossible becoming possible – i.e. Shaykh of Najd not being from progeny of Dhil Khuwaisirah – than he is from the Khawarij which were to re-appear again and again – more then twenty times – from the direction of East. And undeniable historical fact is; Najd and Banu Tamim consistently have been in fore front of Khariji resurgance who subjected the Muslims with barbaric violence. As a result of their barbarity the Muslim leaders made their mission to completely and utterly anahilate them but only to re-appear again. Anyhow proof of Shaykh of Najd’s Kharijism is his methodology –: applying the verses revealed for disbelievers upon Muslims. And demonstrating this truth is Kitab at-Tawheed of Shaykh of Najd. But the choiciest from many examples is -: Shaykh of Najd applying the verses of Quran upon Muslims of Arabia which were in actuality regarding polytheists who did not believe in judgment day – verses such as; 22:5, 23:33/38, 23:80 - : “He who does not enter in to this religion, nor act upon it, nor provide support to its people, nor show enmity against its opponents, according to us is a disbeliever (kafir) in Allah, and the last day.” [Ref: Durar al-Saniyyah, 1/314, See, here] “It’s known regarding the people of our land (i.e. Najd) and the land of al-Hijaz, that those among them who reject the resurrection [after death] are more than those who accept it and that those [among them] who know the religion are less than those who do not, and those who perform Salah are fewer than those who do not perform it …” [Ref: al-Durar al-Saniyyah 10/43, here] Imam Bukhari (rahimullah alayhi ta’ala) brings a statement of Ibn Umar (radiallah ta’ala anhu) under the heading of – Killing Of Khawarij And Mulhidun. This indicates Imam Bukhari (rahimullah) believed it was with regards to Khawarij, the apostates. Ibn Umar (radiallah ta’ala anhu) indicates applying the verses revealed for disbelievers upon Muslims is habbit of worst of creatures in creation of Allah (subhanahu wa ta’ala) - Khawarij: “And the statement of Allah: 'Allah will not mislead a people after He has guided them, until He makes clear to them what to avoid. 'And Ibn Umar used to consider them (the Khawarij and the Mulhidun) the worst of Allah's creatures and said: "These people took some verses that had been revealed concerning the disbelievers and interpreted them as describing the believers.” [Ref: Bukhari, V9, P49, Chap6: Killing The Khawarij And Mulhidun] Note there are number of other Ahadith in which the Khawarij have been said to be worst of creatures. If - just entertaining the impossible with this if - Shaykh of Najd was not geneological desecendent of Dhil Khuwaisirah Ibn Zuhayr even then there is no excuse for Shaykh of Najd. He is from Khawarij and part of re-appearing Khawarij destined to resurface more then twenty times. In section - 0.3 - seven steps were given. In here I will explain the significance of these steps. The first step confirms basic premise (i.e. group of Satan Hadith referrs to Dhil Khuwaisirah who was resident of Najd and from Bani Tamim) on which you argued your case (i.e. Najdi’s from Banu Tamim fought in Iraq – hence they are the group of Satan aka Khawarij, and Hadith of Najd applies to Dhil Khuawaisirah and his companions). Step two establishes from Najd this group of Satan went to Syria (i.e. Siffin) as part of Ali’s (radiallah ta’ala anhu) army and were disenchanted by Ali’s (radiallah ta’ala anhu) decision to arbitrate between himself and Muawiyah (radiallah ta’ala anhu). Step three partly confirms an aspect on which your argument was based on (i.e. Khawarij fought in Iraq) and refutes common misconception and the allegation of Wahhabis (i.e. that Khawarij were Iraqi’s). Step four establishes Dhil Khuwaisirah and his companions were killed in Iraq. And implication of all this was; indeed Dhil Khuwaisirah was from the Khawarij, and he along his companions (i.e. members of his tribe) were from group of Satan, and they were in Najd, and from there they fought in Iraq, and were killed, only few survived. This over all establishes Islamic position and confirms the basis of your argument. Steps five, six and seven establish that Prophet (sallallahu alayhi wa aalihi was’sallam) foretold appearance of two (i.e. major) groups of Satan from direction/lands of Banu Rabia and and Banu Mudhar which happens to be toward East of Madinah and region of Najd. First group of Khawarij was of Dhil Khuwaisirah and his companions. And regarding second group Prophet (sallallahu alayhi wa aalihi was’sallam) said from progeny/posterity of Dhil Khuwaisirah a group of people would emerge who would recite Quran but it will not go beyond their throat. And with this Prophet (sallallahu alayhi wa aalihi was’sallam) pointed; second emergence group of Satan would be from his progeny/posterity. And geneological datal establishes Dhil Khuwaisirah at-Tamimi was ancestor of Shaykh Muhammad bin Abdul Wahhab. And if he was not descendent of Dhil Khuwaisirat at-Tamim even then at very least Shaykh of Najd is most certainly from the Khawarij which were to continously re-appear until last of them would side with Dajjal. It is true; Dhil Khuwaisirah at-Tamimi marched from Saudi province of Najd along side his companions to Syria and than to Iraq where he along side his tribes mates fought against Ali (radiallah ta’ala anhu) and were anahilated. But this fact cannot absolve the Shaykh of Najd from being a Khariji. And it should be evident to you why Muslims accuse the Shaykh of Najd of being a Khariji. He is from posterity of Dhil Khuwaisirah at-Tamimi, or at the very least from more then twenty manifesations to appear [from Najd], and his teachings and actions earned him ascription of being a leader of Khariji sect. If Allah (subhanahu wa ta’ala) permits then twenty plus articles will be produced to show how methodologically and fundamentally Wahhabism and Kharijism are one and the same thing. But for now the connection established between Shaykh of Najd and Dhil Khuwaisirah is suffient evidence of his Kharijism. 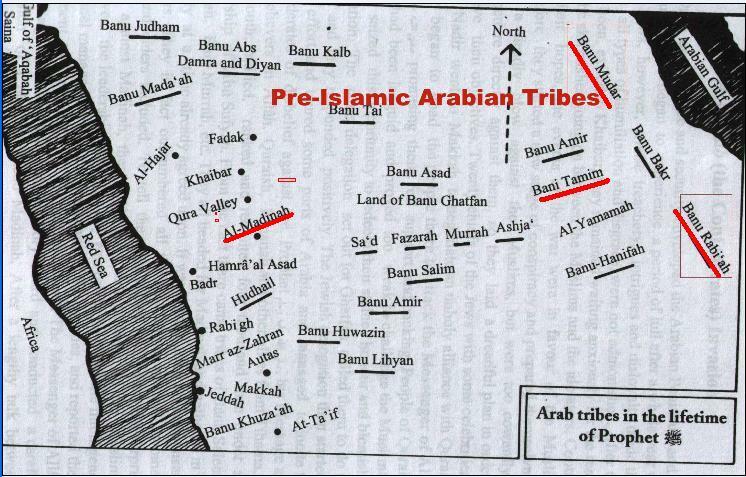 Dhil Khuwaisirah was from tribe of Tamim and this tribe was situated in East of Madinah in central Arabia and in province of Najd. Dhil Khuwaisirah at-Tamimi angered Prophet (sallallahu alayhi wa aalihi was’sallam) and Prophet (sallallahu alayhi wa aalihi was’sallam) told this man has companions so pious; they would embrass even the companions but they will become disbelievers. After this event some time Prophet (sallallahu alayhi wa aalihi was’sallam) invoked blessings for Syria, and Yemen and despite repeated requests refused to supplicate for Najd. Prophet (sallallahu alayhi wa aalihi was’sallam) refused to invoke Allah (subhanahu wa ta’ala) for the inhabitants of Najd stating from Najd the group of Satan will emerge and tribulations. And it should be noted this group of Satan was none other than Dhil Khuwaisirah at-Tamimi and his companions. While he was leaving Prophet (sallallahu alayhi wa aalihi was’sallam) foretold; from progeny of Dhil Khuwaisirah a group of people would emerge who would recite the Quran [but it will not reach their heart] but get stuck in the collar bone, or throat. In another Hadith Prophet (sallallahu alayhi wa aalihi was’sallam) foretold about appearance of two groups of Satan. The first group of Khawarij seperated from the main body of Muslims – i.e. from Ali radiallah ta’ala anhu – at Siffin and appeared as a distinct sect in Iraq. And this first group was composed of Dhil Khuwaisirah at-Tamimi and his companions. They fought against the Iraqi army of Hadhrat Ali (radiallah ta’ala anhu) and the Iraqis killed them. Dhil Khuwaisirah and his companions were completely butchered in battle field only few escaping death. The second group of Khawarij was to emerge from Najd as mentioned in the Hadith. And Muslim position based on the explained evidence is Shaykh Muhammad Bin Abdul Wahhab at-Tamimi is from the progeny of Dhil Khuwaisirah at-Tamimi which is corroborated by the geneological records. And even if Shaykh of Najd was not a direct descendent of Dhil Khuwaisirah there is no doubt in his Kharijism because Prophet (sallallahu alayhi wa aalihi was’sallam) had foretold the resurfacing the Khawarij more then twenty times. There is mountain of evidence such as methological ressemblance to Khawarij: Applying the verses of Kafirs upon Muslims, declaring Muslims as Mushriks, permitting the blood and property of Muslims upon himself and his army. Declaring Muslims Kafir/Mushrik for major sins, rebellion against Islamic state and religious order. Going against the majority like the Khawarij, insulting and disrespecting Prophet (sallallahu alayhi wa aalihi was’sallam) like Dhil Khuwaisirah did. Shaved their heads extremely closely like the Khawarij, fold the trouser or regional equivlent from the waist, killing Muslims but leaving non-Muslims at a time when the British were at their door step in Yemen. And not forgetting Najd and Banu Tamim have played prominent role in insurrections and rebellions of Khawarij through out centuries. -  And current Saudi and Wahhabi alliance with minions of Dajjal and Zionist state of Israel proves how Saudi family and their Wahhabi Ulamah would join forces with Dajjal in a bid to prevent Imam Mahdi (alayhis salam) resting the rule from their clutches. And due to Fatwah of ‘Jihad’ issued by the Wahhabi scholars belonging to, Aal al-Shaykh, and in response the Khawarij from Najd and other regions of earth would join forces with their ally -: Al Dajjal and Zionist state of Israel. This is most likely reason why Khawarij would join forces with Dajjal.